Cable. He tried to paint the European oil painting natural intuitive vivid, rich and delicate oil painting color and the spirit of traditional Chinese art, the aesthetic ideal of integration. 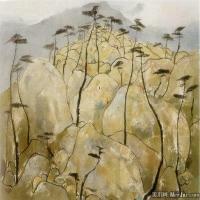 From 70s onwards, Wu Guanzhong gradually and things Chinese painting creation. He tried to use Chinese traditional materials tools to show the modern spirit, and to explore the innovation of Chinese painting. August 29, 1919 (lunar calendar July the beginning of the five leap gate in Jiangsu province) was born in a peasant family in Yixing county. In 1926, Wu attended primary school. In 1930, studying in Yixing County goose Hill Primary school. In 1931, graduated from primary school, was admitted to the Wuxi normal school. 1934, completed three years of normal junior high school, enrolled in the school of science and technology, Zhejiang University, the Department of electrical engineering. In 1935, for Hangzhou national art school. 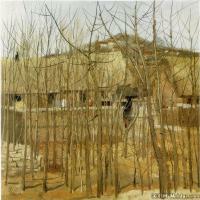 In 1936, the Hangzhou National College of art and China studied western painting painting and watercolor painting. 1937, the outbreak of the war of resistance against Japan, President Lin Fengmian led the school teachers and students, and the people together to evacuate Hangzhou. 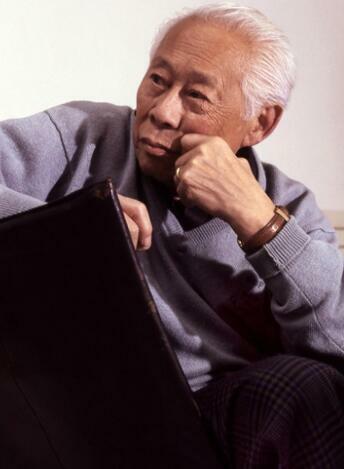 In 1938, his high school graduation, to the science of painting, Chang Shuhong Peterman and Guan liang. At the same time also learn Chinese painting. 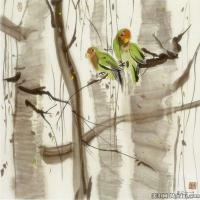 In 1940, China transfer painting, became a pupil of Pan Tianshou's, a lot of copying painting boutique. 1941, still infatuated with the color of oil painting, the reversal of the Department of oil painting. 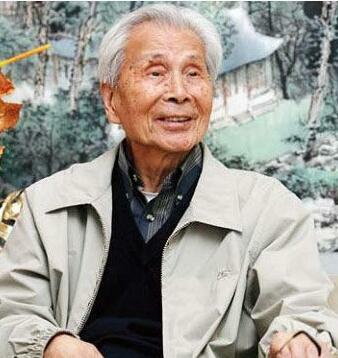 In 1942, graduated from the national Hangzhou art academy. Chongqing University assistant professor. 1943, in Chongqing, Shapingba Youth Palace held the first solo exhibition in Sichuan. In 1946, a national scholarship to study abroad painting first, went to France to study abroad. In 1947, at the Paris National College of Fine Arts Professor Su's skin study painting studio. In 1948, works to participate in the Paris spring salon show and autumn salon exhibition. 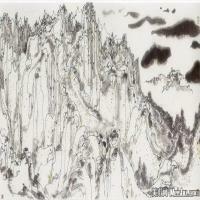 In 1978, the central process of Academy of Fine Arts, sponsored by Wu Guanzhong works exhibition"
In 1987, the Hongkong Art Center hosted the Wu Guanzhong retrospective exhibition"
In 1993, the French Paris Sainiuqi Museum "to the world - Wu Guanzhong painting ink sketch show", and awarded him the gold medal "in Paris city"
In August 2007, the Hunan Fine Arts Publishing House published "the complete works of Wu Guanzhong"
The evening of June 25, 2010 at 23:57 in the Beijing Hospital died at the age of 91. From Wuxi normal junior high school after graduation, Wu Guanzhong was admitted to the Zhejiang University for provincial industrial high school occupation. 1936 transferred to the Hangzhou Academy of art, from Li, Chang Shuhong and Pan Tianshou and other learning, the West painting. 1942 graduated from the Chongqing University as assistant. In 1946 admitted to the public to study in france. From 1947 to 1950 in Paris Higher School of Fine Arts Professor Su J. The studio also studied oil painting skin; learning in A. Lott studio, the study of art history and art history, Lu in the school, the results are excellent. 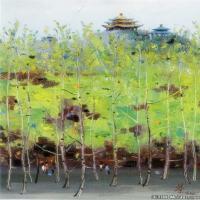 Wu Guanzhong returned to the autumn of 1950. 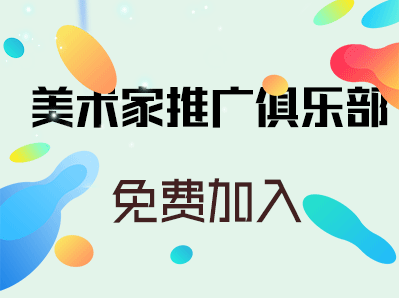 Has taught at China Central Academy of Fine Arts, Tsinghua University, Department of architecture, the Beijing Institute of the arts, the central process of Academy of Fine Arts. He is currently the executive director of the Chinese Artists Association and the National Committee of the CPPCC National Committee and other members of the Chinese Artists Association. Wu Guanzhong in 50 ~ 70s, is committed to the creation of oil painting landscape, and the exploration of the nationalization of oil painting. He tried to paint the European oil painting natural intuitive vivid, rich and delicate oil painting color and the spirit of traditional Chinese art, the aesthetic ideal of integration. 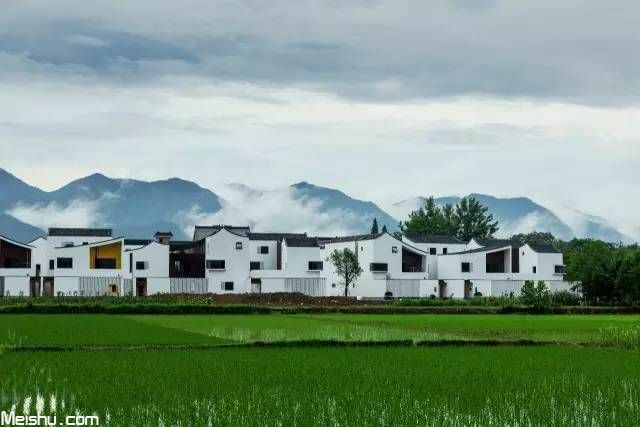 He is good at the performance of Jiangnan scenery, such as early spring green, thin mist, waterside cottage, black tiles and white walls, harmonious, fresh color, quiet, light and beautiful realm, infection of the picture has a lyrical. 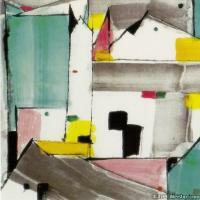 From 70s onwards, Wu Guanzhong gradually and things Chinese painting creation. He tried to use Chinese traditional materials tools to show the modern spirit, and to explore the innovation of Chinese painting. His painting art novel, unique, good will by a quality suggestive of poetry or painting point line surface interwoven show. He is in love, rhythm and corresponding psychological feelings in semi abstract form of musical nature. 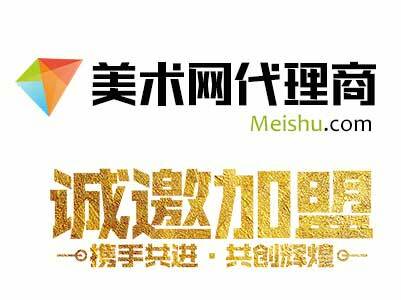 Both the rich traditional oriental charm, and the characteristics of the times, so that the audience find everything fresh and new. As an art educator, Wu Guanzhong pays attention to the cultivation of students' artistic personality. As a thoughtful artist, he was diligent in writing, and the text argument is unique, vivid and smooth. In the view of abstract beauty, form beauty, form decision content, life and art, such as kite's constant line, it has caused the controversy of art circles. 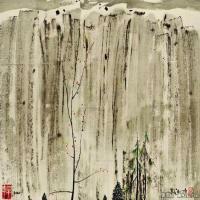 Wu Guanzhong's oil painting represents "the Three Gorges of the Yangtze River", "Lu Xun's hometown" and so on. Chinese painting representative of "spring snow" and "Lion", "the Great Wall" etc.. The publication of "Wu Guanzhong album", "Wu Guanzhong", "Wu Guanzhong paintings", "Wu Guanzhong oil painting Chinese painting collection" (1 ~ 4) and "find the west looking east", "the kite line", "", "who fly far apart from each other," Wu Guanzhong "the sketch, color paintings," "Wu Guanzhong", a series of China paintings "Wu Guanzhong prose" etc..
Wu Guanzhong is one of the representatives of modern Chinese painting in twentieth Century. 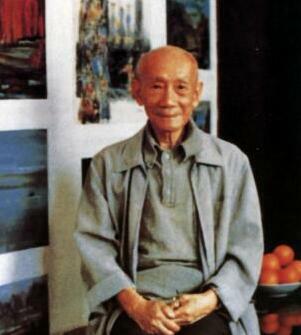 He made a great contribution to Chinese modern painting. For a long time, his tireless efforts to explore the different aesthetic concept of Western painting art in two languages, firm and indomitable to practice the "nationalization of oil painting", "painting China modernization" creation concept, formed a distinctive artistic characteristics. He dedicated to keep watch in the motherland, in the hometown, in their homes, in their heart, the real feelings, expressing the national and the public's aesthetic needs. Wu Guanzhong's works have very high cultural character, from the beginning of 1980s, his artistic ideas and painting will need to adapt to the development of history and the times, to promote the evolution and development of the modern concept of painting China. 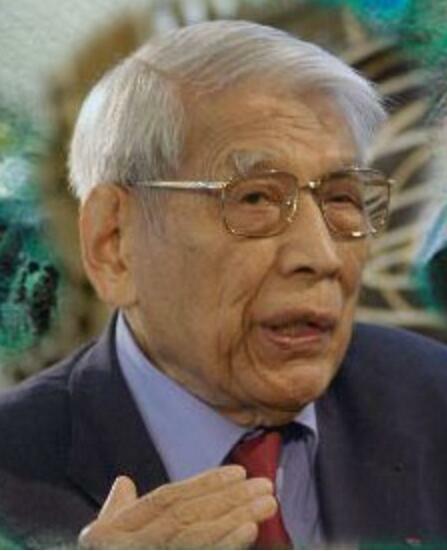 Wu Guanzhong has made great achievements in art creation and art education, devoted to the exploration of oil painting nationalization and modernization of Chinese painting, and enjoys a high reputation both at home and abroad. Many held a personal exhibition in Chinese gallery and national ten main city, and has held exhibitions in National Museum of Singapore, Hongkong Art Center, San Francisco cultural center, the Bermingham Museum, the University of Kansas Art Museum, New York Museum and Saint John Museum of Detroit, British Museum, Paris Municipal Museum Sainiuqi. 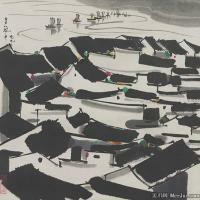 Has published more than 50 kinds of personal collections, personal essays have "Wu Guanzhong art", "Wu Guanzhong", "beautiful prose", "edge of the scenery of life", "Wu Guanzhong anthology" a dozen. In MR Wu Guanzhong's eyes, by the interpersonal relationship, the art market benefits package, the economic ups and downs etc. People can not avoid the impact of factors. Chuang-tzu once said "all in a person". 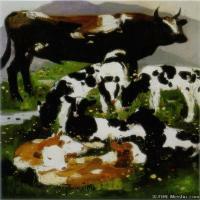 Wu Guanzhong said: art is a natural form of the times, there must be sincere retention and ruthless elimination. The art market is a mirror. But God only takes care of the artist, not the man who is in the mirror. The 5. Wu Guanzhong: This is a very old idea. I mean the first can not leave the picture, from the picture, the separate lines, colors are zero. Pen and ink is not a formula. In September 1991, Wu Guanzhong arranged home paintings, hundreds of works will not be satisfied with all destroyed, overwhelmed overseas people known as the "burning luxury house" destroyed in action, only one purpose: to let the experts keep tomorrow not fault picture! Before long, the author has a taste of Wu Guanzhong's serious strength. At the beginning of 1993, people's Daily Overseas Edition, people's Liberation Army and the Hongkong Oriental Art Center jointly organized the "Oriental Cup" international painting contest, director Wu Guanzhong invited the jury. On that morning, more than and 70 year old Mr. Wu came to the people's daily, wearing a casual suit, foot athletic shoes. The first round, the elimination of poor works. The hall walls covered with paintings, some can only be placed on the ground. The poor works of nature was eliminated, but the form of good will have the same fate. I saw the judges imitation style works, the judges will take a smile! All the works are not imitation. To imitate the true feelings of the artist. The inscription Wu Guanzhong served as director of the jury for the contest is: "their own true feelings, not her." The second round, the one or two, three and other awards and outstanding award. Mr. Wu to examine each works carefully, far see a knee squat, sometimes look at work, from time to time in a small book carefully recorded, for a busy day. In November 1993, 74 year old Wu Guanzhong sued two auction companies auction counterfeit his name "Mao Zedong" pretending to bombard the headquarters of infringement, ask to stop infringement, eliminate the effect, make a public apology, and compensation for economic losses. In the end, Wu Guanzhong won. "The man who has cheated today, will not deceive tomorrow," Wu Guanzhong told people. Mr. Wu has outlined the image to deal with the know-how of the relationship. He was so young painter Ariadne: "you must wear master slippers to walk, and then put the slippers away, in the process of wearing and taking off, you will find yourself. That's how I came here." Wu Guanzhong once wrote: "Congyi, such as hunter career, the mountains after leopards, bow shoot eagles. Without prey such as homeless, lost heart on. In the hunt, which is created, exhausted life, but the flowers of life by bright, although thin, is a strong minded." Self comment on the new road: "the grass of the grass, the vicissitudes of life taste bitter, but more close to the real life. Think of the past, often more general, more prominent somewhere facial features, it has a simple picture, emphasizing the pain and helplessness -- life presents music, not by sound sweet, when there are not old, old or old friends." Mr. Wu said, "all art more than music to poetry, poems in". He also said: "I have said this, Qi Baishi can not, a little more than one also does not matter, but Lu Xun is not the same, I am a single from the social function, they are not the same effect. Qi Baishi draws well, I also like, but a nation, a country needs Lu Xun. A little Lu Xun, Chinese would not be stronger."